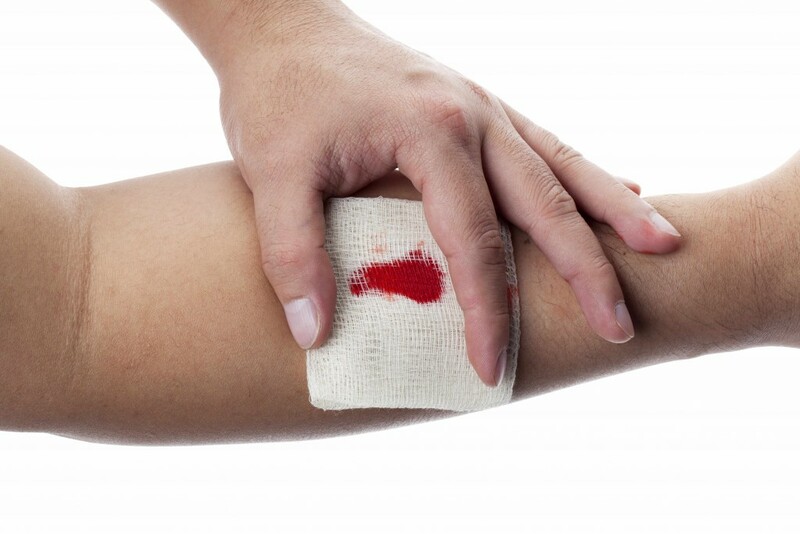 Post-hemodialysis site hemorrhage (PHSH) is often encountered in the emergency department and although apparently a simple problem, sometimes can be quite difficult to stop and require a lot of time, effort and expertise to do so. Life-threatening bleeding for an arteriovenous fistula (AVF) is a different clinical problem and frequently requires systemic hemostatic management including protamine and desmospressin and vascular surgery consultation, in this post we will focus on PHSH. Typically the patient with PHSH will present with persistent bleeding from the access site on the AVF after their hemodialysis run despite direct pressure by healthcare staff. Fistulas are accessed using a 16-gauge or larger needles and heparinoids are used to prevent clotting in the circuit during the procedure. Is this combination of a relative large puncture site, semi-arterial pressure in the vessel and the coagulopathy related to the patient (uremia, platelet dysfunction) and the dialysis circuit (heparinoids) that can make the management difficult. Like any other procedure in Emergency Medicine, it is important to have the patient appropriately monitored and with intravenous access; be sure the patient is positioned in a manner that will allow you to stand and work comfortably, as this problem may take a good 30' to an hour to be resolved. Good lighting conditions, full gown and eye wear are strongly recommended. The single most important intervention to stop PHSH is strong and direct pressure over the bleeding point. Placing pressure with "gauze and tape" won't fix the problem, the pressure needs to be applied with gloved fingers for at least 15-30', using a two-hand technique while the non-dominant hand putting pressure proximal to the bleeding point and the dominant hand putting pressure in the bleeding point can be helpful. Expecting gauze, even Combat gauze, to stop bleeding without a significant amount of direct pressure is magical thinking. A temporizing maneuver while you are getting all your stuff together is to use the gallipot [basin] technique, where you place the gallipot facing up and tied strongly to the arm. Hemostatic gelatins like Gelfoam can provide hemostasis providing a matrix to facilitate platelet aggregation and coagulation, but remember, this should be applied in tandem with direct pressure. Finally, when all previous techniques have failed, surgical repair is probably necessary. Here an excellent video by the great Al Sacchetti (@SacchettiAlfred) demonstrating a figure-8 suture to stop PHSH. Remember to place pressure above, below and in the bleeding site; also ideally use a non-cutting needle to treat the suture in order to avoid more bleeding. 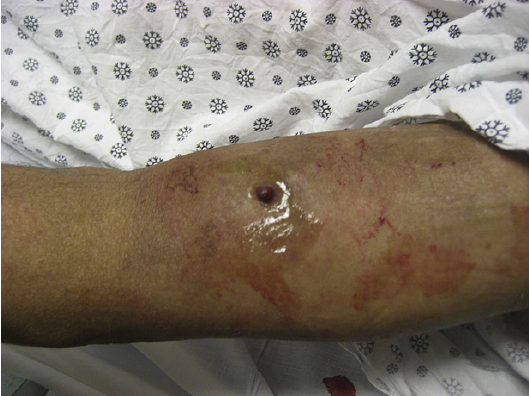 Reddy V, Bagul A, Qureshi A, Nicholson M. A Simple Technique to Control a Bleeding Arteriovenous Fistula. Ann R Coll Surg Engl. 2006 Oct;88(6):592–3. Perera T, David R, Lin K, Li SF. A Novel Use of 2-Octyl-cyanoacrylate: Controlling Post-hemodialysis Site Hemorrhage. The Journal of Emergency Medicine. 2013 Feb;44(2):467–8. upper arm fistula anastomosis is distal (not proximal) to cannulation sites. the arterial vessel is close to the surface at the anastomosis. gentle pressure distal to fistula will stop bleeding so pressure dressing or sutures can be placed without arterial bleeding.